OFFICIAL ANNOUNCEMENT OF EXTRATERRESTRIAL LIFE? ¿ANUNCIO OFICIAL DE VIDA EXTRATERRESTRE? On April 22, 2010, DARPA tested a launch system for the Falcon Hypersonic Technology Vehicle, and the HTV-2 itself. After reaching certain altitude the vehicle should have glide flying until splash down softly over the Pacific Ocean, near the Kwajalein Atoll. But 9 minutes after the launch, the contact with the HTV-2 was misteriously lost. The Defense Advanced Research Projects Agency (DARPA) announced that it launched its Falcon Hypersonic Technology Vehicle 2 (HTV-2) at 16:00 PDT yesterday. 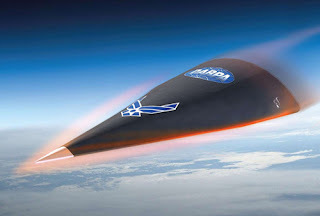 DARPA’s Falcon HTV-2 program objective is developing and testing an unmanned, rocket-launched, maneuverable, hypersonic air vehicle that glides through the Earth’s atmosphere at incredibly fast speeds—up to Mach 20. The key technical challenges of the HTV-2 program are the design and testing of an innovative high lift-to-drag aerodynamic shape, advanced lightweight but tough thermal protection structures, materials and fabrication technologies, autonomous hypersonic navigation guidance and control systems, and an autonomous flight safety system.